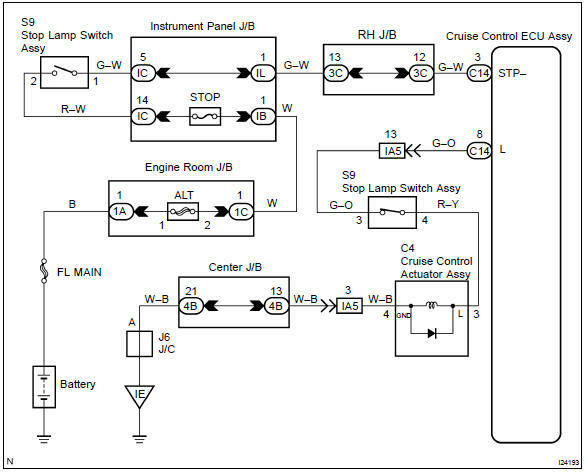 When the brake pedal is depressed, the stop lamp switch assy sends a signal to the cruise control ecu assy. When the cruise control ecu assy receives this signal, it cancels the cruise control. A fail–safe function is provided so that cancel functions normally, even if there is a malfunction in the stop light switch circuit. The cancel conditions are: battery positive voltage at terminal stp–. When the brake pedal is depressed, normal battery positive voltage normally is applied through the stop fuse and stop lamp switch assy to terminal stp– of the cruise control ecu assy, and the cruise control ecu assy turns the cruise control to off. If the harness connected to terminal stp– has an open circuit, terminal stp– will have battery positive voltage and the cruise control will be turned off. Also, when the brake pedal is depressed, the magnetic clutch circuit is cut mechanically by the stop lamp switch assy, turning the cruise control off.